We all know babies are supposed to sleep a lot but how much sleep is enough? What effects can lack of sleep have on your child and are they dangerous or unhealthy? Does sleep impact other aspects of your child’s growth, health and development? Let’s look at just a few ways that poor sleep habits and not sleeping enough can affect your baby, toddler or developing child. A number of recent studies from sources such as Harvard University, The National Sleep Foundation and numerous other academic and health institutions have shown that inappropriate sleep patterns and insufficient sleep can contribute to childhood obesity in a number of ways. Is sleep a contributor to your child being obese because they don’t rest enough?. HOW CAN SLEEP AFFECT MY CHILD’S WEIGHT? Lack of sleep has been linked to increased appetite and a reduction in certain hormones that control appetite, this results in increased hunger. Psychologically and physiologically the body can mistake the signals of tiredness and a person can interpret that they are hungry when in fact they are simply very tired. Instead of resting your child may ask for a snack to keep them going and you have to make sure that it is a healthy one, and not contributing to poor eating habits. Fast foods, junk, and soft drinks, cannot be a substitute for getting enough rest. Take notice if your child is looking for a quick energy fix, in the same way an adult desires a coffee to pick them up during the day when they are flagging. The end result may be that a simple thing such as not enough sleep can lead to regularly poor eating habits, fluctuations in blood sugar and insulin levels which in turn leads to more sleep disturbance and even severe health issues. The consequences can be life long so consider appropriate sleep as a long term investment into your child’s health. HOW CAN SLEEP AFFECT MY CHILD’S ACTIVITY AND DEVELOPMENT? A child who is tired, the same as an adult, will be less likely to be able to sustain a good exercise routine and in children, this will manifest as tiredness and unwillingness to play or be involved in activity that they normally would enjoy as well as potentially over eating. Your child may see a need for sleep as a need for food to give them energy. Less activity may lead to weight gain and losing weight may be much more difficult for a child that is inactive and has no energy to play or run around normally. 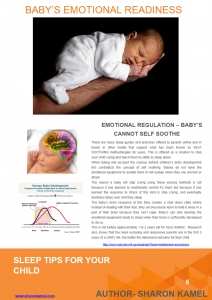 Long term, this will affect your child’s growth and physical development in a negative way. Lack of sleep has also been linked to childhood behavioural problems as well as childhood obesity. Imagine yourself after a restless night and consider if you are able to function as you would do normally. Do you lose your temper a little more? Are you impatient and more easily bothered by things you would normally ignore. In children poor sleep habits can result in increased temper tantrums, inability to socialise in the same way, and other extreme behaviour such as withdrawal and aggression. If sleep disturbance or lack of sleep continues to be a long term problem, then it can have an impact on your child’s development and their ability to learn and retain information more long term. IS MY CHILD SLEEPING ENOUGH – HOW MUCH SLEEP DOES MY CHILD NEED? 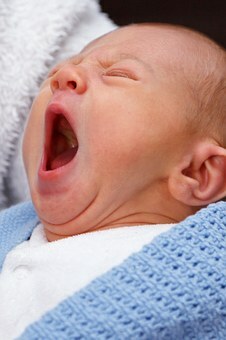 NEWBORN BABIES UNDER 3 MONTHS – Newborns sleep a total of 10.5 to 18 hours a day. INFANTS OVER 3 MONTHS AND UNDER 12 MONTHS – Infants typically sleep 9-12 hours during the night and take 30 minute to two-hour naps, one to four times a day – fewer as they reach age one. TODDLERS UNDER 2 YEARS – Toddlers need about 11-14 hours of sleep in a 24-hour period. When they reach about 18 months of age their nap times will decrease to once a day. PRE-SCHOOL CHILD UNDER 5 YEARS – Preschoolers typically sleep 11-13 hours each night and most stop taking a nap after 5 years of age, except for unusual circumstances, such as travel or illness. SCHOOL CHILDREN – PLUS 5 YEARS AND UP TO TEENS – Children aged six to 13 need 9-11 hours of sleep. In a recent interesting study by Hampton Court School in Surrey UK, it was discovered that teenage children performed better in a range of areas when their lessons began at 1.30pm in the afternoon instead of in the early morning. The school has noted that it has boosted the teenagers concentration levels and improved performance at school since it trialed this new approach to school hours. Studies such as this demonstrate that sleep plays a very important role in the function of the brain and in the outcomes children can achieve if they are given an opportunity to get appropriate amounts of sleep. You can see some reports about the study here. 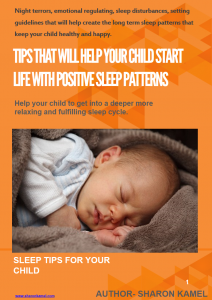 To claim your FREE E-BOOK 10 TIPS TO HELP YOUR HELP YOUR CHILD SLEEP full of hints, tips and scientific back up to help you understand how and when your child is ready to sleep alone, register your DETAILS HERE and it will be rushed straight to your inbox. Contains useful information such as how to deal with night terrors and sleep fears, how to establish a great baby sleeping routine, the myth of self-soothing sleep for your new-born and many other tips to try out at home. GET YOUR FREE BOOK NOW!